I usually don't get star struck. I worked at newspapers for seven years and worked with bands for a few years. You name someone in the music industry, and I probably met or interviewed them. Someone famous, and we probably brushed paths. Kiefer Sutherland? Introduced himself by saying, "Hi, I'm Kiefer." To which I replied, "Nice to meet you. I'm Lisa." Weird Al? Check. Ricky Havens? Yup. Isaac Hanson? Yes. It was my job, and I took my job very seriously, and didn't get flustered or star struck. But in the wedding industry, I'm a nobody. I'm a very very small blogger, trying to carve a name for myself. I don't have a big publication to back me. I have myself and my staff of one (I'm the one). So, in the wedding industry, when something big (or something small to most people) happens, well, I get a little star struck and give myself a little fist pump. David Tutera. Yes the David Tutera. Celebrity wedding planner and host of WE tv's My Fair Wedding, David Tutera. Wedding book author, David Tutera. 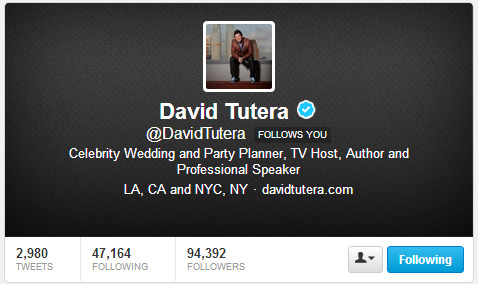 And sure David Tutera is also following 47,163 people who aren't me. But he is following one person who is me, and that's kinda exciting, kinda makes me feel like, "Well if he knows who I am, maybe there is a chance other people will know who I am and I can really carve a place out for myself in the wedding industry." When you're thisclose to going crazy from wedding planning, it's things like this that brighten your day. BRIDAL BABBLE: What's the last little thing that you thought was a big deal? I was really surprised to see Sweepstakes blogs following and retweeting me (I must enter a lot of giveaways and sweeps! ).